Homepage / Articles and Blogs / Regev Responds / The Rabbinate should not be repaired. It should be shut down. The Rabbinate should not be repaired. It should be shut down. 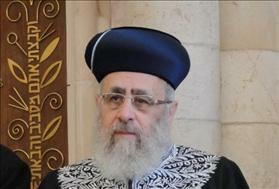 Britain’s chief rabbi called Chief Rabbi Yosef's remarks “totally unacceptable.” British Jewry’s Board of Deputies accused Yosef of “betraying his office.” The Anti-Defamation League said his statement was “utterly unacceptable.” You may have been among the dozens and dozens who denounced Yosef on Twitter and Facebook. Such outrage is welcome, but raises the question: Where have you been? Is this really the most egregious utterance made by Rabbi Yitzhak Yosef, his late father Rabbi Ovadia Yosef, his brother Rabbi Avraham Yosef or the other fundamentalists among Chief Rabbinate officials and in Israeli religious politics? This may be a good opportunity to identify the essence of the problem we face, which goes beyond any specific, crass pronouncement. First, it is important to understand the contradiction between the promise of Israel’s Declaration of Independence for “freedom of religion and conscience, and equality for all, regardless of religion,” and a Chief Rabbinate that is granted coercive authority by the state with far-reaching adverse consequences on civil liberties as well as severe economic ramifications. No normal democracy has the institution of a state-created and -empowered Chief Rabbinate. Britain’s chief rabbi isn’t really the country’s chief rabbi, nor does he hold any state authority. He is the chief rabbi only of The United Hebrew Congregations, which voluntarily includes only about 30 percent of the British Jewish community. In Israel, the chief rabbis of the country and the cities are funded by the state and granted monopolistic powers, and their selection is controlled by cynical political interests. Second, it is important to know that the Jewish public is broadly opposed to the Chief Rabbinate’s positions, which are forced upon it, and has very little trust in the Rabbinate. The 2017 Israel Democracy Index, which measures levels of trust in public institutions, demonstrated that 88 percent of Israelis trust their military and 57 percent the Supreme Court, but only 20 percent trust the Chief Rabbinate. Polls by my organization, Hiddush, showed comparable findings. Third, this recent outburst is reflective of a consistent, anachronistic and objectionable outlook that conflicts with basic democratic principles. It poses a serious threat to the rule of law and the principle of equality. Rabbi Yosef’s statement is one of a plethora of expositions of the Jewish tradition made by him and like-minded religious extremists. Just a few days after the “monkey” speech, he spoke about the secular judges in Israel’s civil courts, stating that “none of them are eligible to serve as witnesses,” let alone “sit in judgment,” and that Jews should not bring their disputes before Israel’s civil courts. His brother Avraham publicly declared that those who hold senior positions in the Israeli civil service or civil courts, whether secular or religious, should not be called to the Torah, allowed to lead prayers or even be counted in a minyan. The extremists are not limited to the Sephardic rabbinic tradition. Comparable views come from the Ashkenazic side with no less vitriol. No wonder, then, that the 2015 Pew survey of religious views of Israelis found that 86 percent of haredi Orthodox and 69 percent of Zionist Orthodox hold that rabbinic law, or halacha, should be state law. Only 5 percent of secular Jewish Israelis agreed. The survey further found that 71 percent of Zionist Orthodox maintain that Arabs should be expelled, compared to 36 percent of secular Israelis. The 2014 Israel Democracy Index showed, disturbingly, that 58.8 percent of Zionist Orthodox and 50.6 percent of the haredi Orthodox agree that Jewish citizens of Israel should have greater rights than non-Jewish citizens, compared to 23.1 percent of secular Israelis. These views, as we can see in the Pew and IDI surveys, are widely shared by the haredi Orthodox and Zionist Orthodox sectors, although, thank God, not by all. Some of the leading voices opposing these racist and anti-democratic views come from Modern Orthodox rabbis, intellectuals and civil activists. The biggest mistake one can make is to tolerate such pronouncements. Behind them lies a consistent outlook fueled by the desire to advance a theocratic Torah state. Its proponents systematically engage in delegitimizing anyone who stands in their way (especially the Supreme Court and the non-Orthodox movements) and promoting coercive legislation that undermines women’s rights, restricts the public’s freedoms on Shabbat, perpetuates the excessive privileges of yeshiva students, and blocks freedom of religion and worship. The institution of a coercive state rabbinate is a severe threat to Jewish unity, to democracy, to the non-Orthodox streams, and also to Modern Orthodoxy (as can be seen over recent challenges to their rabbis over conversion and kosher certification). As we are about to celebrate Israel’s 70th anniversary, we need to join together, as did Rabbi Marc Angel and I in launching the “Vision Statement: Israel as a Jewish and Democratic State,” which has already gained the endorsement of leading American and Israeli rabbis, intellectuals and civic leaders from across the political and religious spectra. It’s time for lovers of Israel, from Orthodox to secular, from across the Jewish world, to work assertively toward the full realization of the founding vision of the State of Israel. Rabbi Yitzhak Yosef’s misguided utterances about black people, monkeys and civil judges merely reflect the enormity of the challenge facing us.